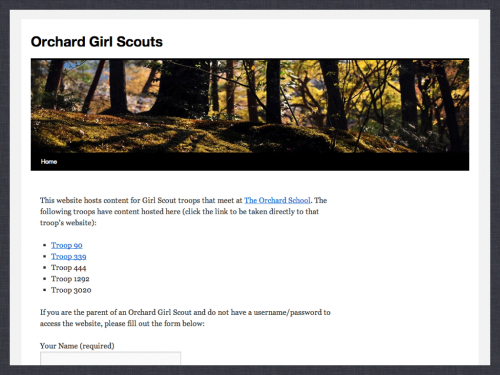 Cardinal Acres Web Development had already designed a website for the Girl Scout troops at The Orchard School. Using BuddyPress in the redesigned website allowed for interaction between troop leaders and parents, something that was missing from the original design. The new design also allows for parents to reserve space at upcoming troop events to assist in planning as well as allowing parents to upload photos and videos to share. All content is private thanks to the Private Community for BP plugin and parents receive email notifications of activity within their troop (implemented as a BuddyPress group) via the BuddyPress Group Email Subscription plugin.